If you're after a casual yet dapper outfit, reach for a black and white leather bomber jacket and Incotex slim fit tailored trousers. Both items are totally comfy and will look great paired together. Take your getup into a more casual direction with navy low top sneakers. As you can see here, being a dapper dude doesn't require that much effort. 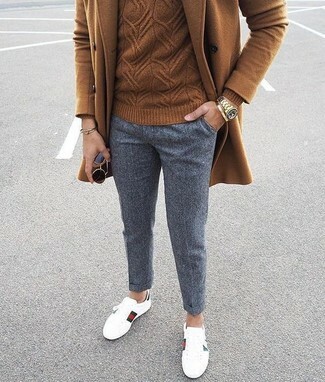 Just go for a grey overcoat and Incotex slim fit tailored trousers and you'll look great. When it comes to footwear, this outfit is round off nicely with black knee high boots. 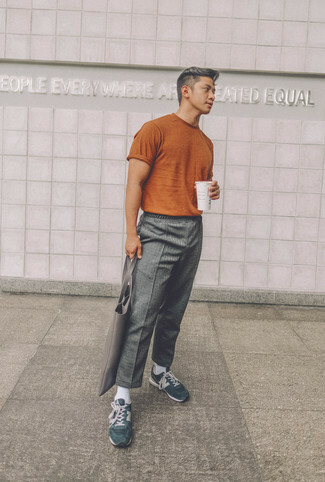 If you're scouting for a casual yet dapper ensemble, consider wearing a charcoal crew-neck sweater and Incotex slim fit tailored trousers from farfetch.com. These two garments are super comfortable and will look great paired together. Go for a pair of white leather high top sneakers to loosen things up. If you're on the lookout for a casual yet stylish outfit, team a tobacco crew-neck t-shirt with grey wool chinos. These items are very comfortable and look great when worn together. Add a more relaxed twist to your look with dark green suede athletic shoes. 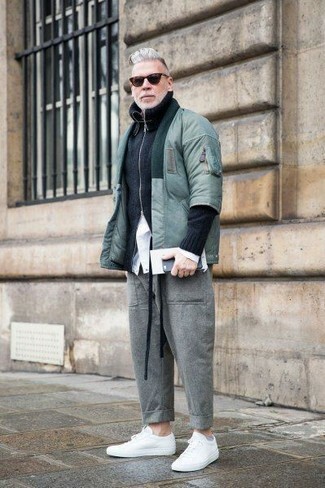 If you're hunting for a casual yet on-trend ensemble, wear a mint bomber jacket and Incotex slim fit tailored trousers from farfetch.com. These pieces are very comfy and look incredible when worn together. White leather low top sneakers will deliver a more relaxed feel to your getup. Contrary to what you might believe, being a dapper dude doesn't require that much effort. 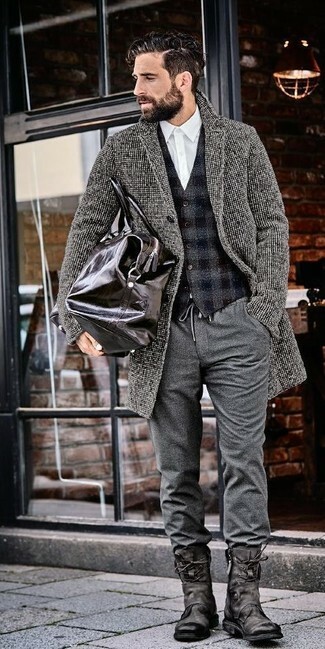 Just try teaming a black overcoat with grey wool chinos and you'll look great. 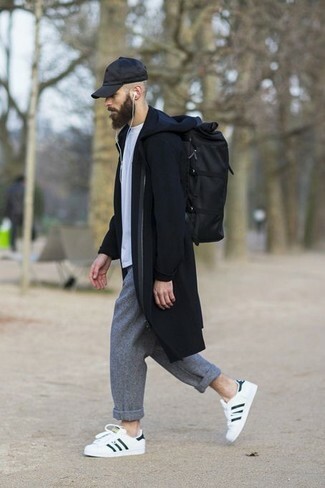 Choose a pair of white and black leather low top sneakers to make the outfit current. 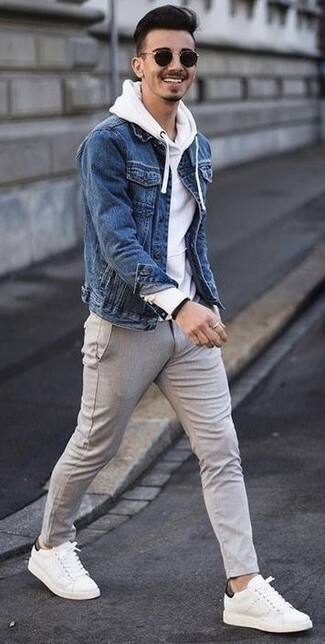 If you're on the hunt for a casual yet seriously stylish outfit, consider wearing a blue denim jacket and Incotex slim fit tailored trousers. Both pieces are very comfortable and look fabulous paired together. Make your ensemble more fun by complementing it with white leather low top sneakers. This combination of a brown overcoat and Incotex slim fit tailored trousers is so easy to pull together in no time, helping you look awesome and ready for anything without spending a ton of time combing through your closet. Make your ensemble more fun by rounding off with white leather low top sneakers. 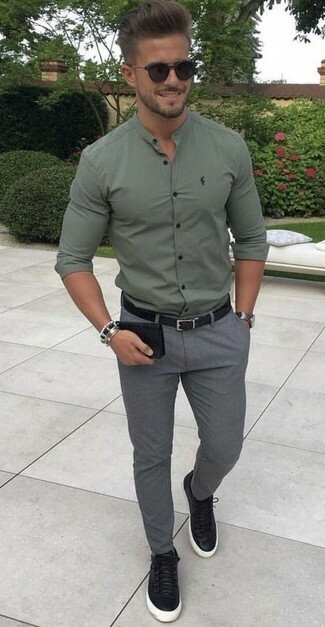 If you're after a casual yet on-trend look, dress in an olive long sleeve shirt and Incotex grey wool chinos. These items are super comfortable and they will also look great paired together. Make your look more fun by rounding off with black leather low top sneakers.